LINE is one of the largest, if not the largest, messaging services out of Japan. It isn’t huge in North America, but it’s pretty big in east Asian countries. I use it to chat with my family on a daily basis. We could technically use other services like Google Hangouts or iMessage, but my mother and sister vastly prefer LINE for the personality it brings to the table. Before the most recent update, I was ready to leave LINE because of its lackluster support for the iPad. The iPhone app is passable, but the official LINE for iPad app hasn’t seen an update since Oct 2014. It didn’t display at proper resolution on the iPad Pro, and you couldn’t reply to notifications. It seems as though LINE has chosen to simply ignore the dedicated iPad app and have updated the main app to become universal. 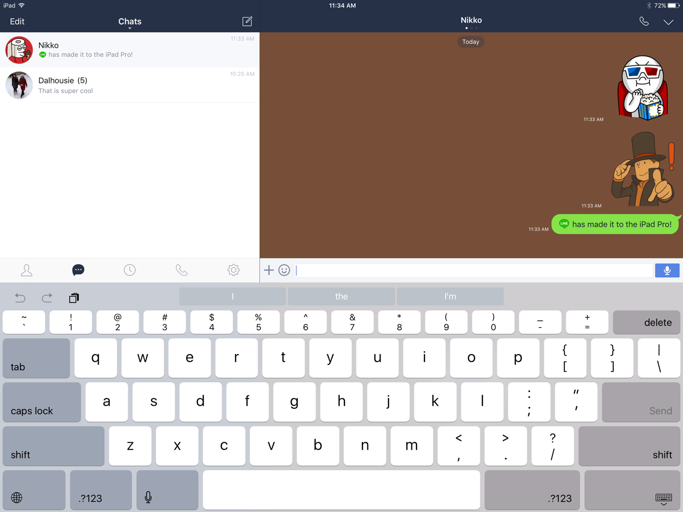 LINE is now a decent iOS 9 citizen across all iOS devices: it supports notification replies, and it scales properly for the iPad Pro’s hi-res display. It’s still not a great app, though. It lacks Split View or Slide Over support, and it won’t let you load up directly to the Chats view. It insists on pushing a Facebook/Twitter-esque timeline upon its users, and relegates actual chatting to a secondary “Chats” tab. However, I stick with LINE because that’s where my family is, and they love LINE for the stickers. Stickers are a huge, huge thing in LINE. TechCrunch reported that LINE made $75M from stickers alone from May 2014 through May 2015. That’s an awful lot of money spent on digital stickers that are only usable within the LINE app, and if you had told me about this statistic before, I would have shaken my head. I would have believed you, but I’d have dismissed the number as something silly and ridiculous about popular culture that I would never understand. Then I saw the awesome stickers my family would buy for $2 or $3 a pop. Not all of them are great, but some of them are really charming and incredibly endearing. They can feel a lot more personal than emoji because someone went to lengths to pick them, and each person in my family has ended up with their own set of custom-picked stickers. Stickers are larger and more expressive than the standard emoji baked into iOS 9, and LINE is smart enough to have tagged many stickers with keywords. Typing words like “Wow” or “hungry” will trigger a selection of relevant stickers, which makes them much easier and more fun to use. It’s not about knowing your selection, but having stickers compliment the current conversation. Stickers won’t be a surprise to regular users of Facebook Messenger, but I think LINE still has the best selection of any messenger service I’ve used. I’ve spent about $4 on stickers myself, and although I’m not tempted to buy any more, I understand the draw now. They’re not a necessary component for chatting, but they’re a ton of fun to have around — especially when the app can has stickers specifically tagged with keywords. I like how I can type “surprise” and have all the relevant stickers pop up as selections. I don’t hope to convert many people to LINE by writing about it, but it is an interesting study in how a messaging service can distinguish itself. Free video and audio calls or multi-user chats aren’t unique features any more, so LINE has done something special by embracing stickers by making them more personal, and a lot more convenient to use.